Batchelor Institute launched its CALL Collection digital archive, a dedicated site populated with first nations language recordings of which Ngun Koongurrukun will become a contributor. 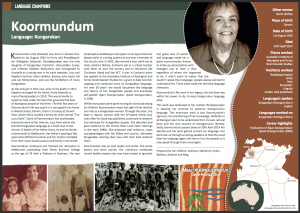 We celebrate the efforts of Wetjey Koormundum (Aunty Ida Bishop) who persevered over 30 years to restore and revive our language to us. Her commitment was motivated by a promise to her mother Margaret Edwards (McGuinness) to record the language of our country. This would not have been possible without the support of her relatives, tribal Elders such as, Uncles John (Jack McGinness), Valentine McGinness and Joseph Daniel McGinness, George Abluk, Magdeline England, Roger Yates, Jimmy Tupnook and Edith Cowan University’s Dr Toby Metcalfe and her precious mentor, her Mother. This means of course that you may order a copy of Ngun Koongurrukun online as well as through our website via email request. We especially thank the Warrai and Malak-Malak Elders who have since passed, who faithfully looked after our interests. Copyright 2019 © Kungarakan Culture & Education Association. All right reserved. Photos by Tegan Christophersen, Territory Wildlife Park and Maguwerr.